L. J. 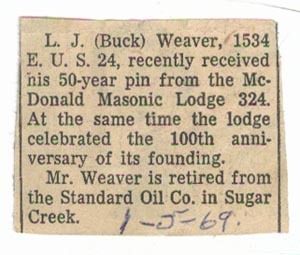 (Buck) Weaver, 1534 E. U. S. 24, recently received his 50-year pin from the McDonald Masonic Lodge 324. At the same time the lodge celebrated the 100th anniversary of its founding. Mr. Weaver is retired from the Standard Oil Co. in Sugar Creek. Newspaper clipping from unknown source, found attached to a War Ration Book Four stating name as Lawrence J. Weaver, Indep., Mo. Are you looking for WEAVER ancestors? If so, we suggest posting a query to our Community Message Board to get assistance from other researchers.